Spoiler Alert - I'm talking about the end of the film in this post. Like most individuals who considered themselves to be more or less 'adult', I found myself sat in the cinema, crying into my £9 vat of popcorn, as Andy waved farewell to his toys after passing them on to the little girl for the next generation. But unlike most individuals, the reason I was crying wasn't out of the gentle realisation that I'm not a child any more nor the warm emotional fug of remembering the happy times playing with my toys. No. Although I did have some of those tears, they were matched by missing my Hoob, who was back home in Doncaster while I was visiting my little sib in Cambridge. 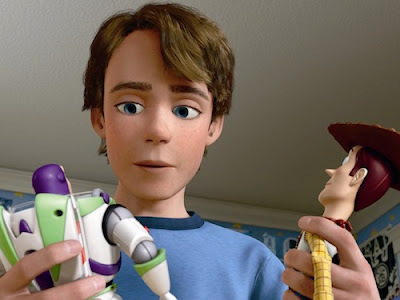 Toy Story 3 was great, but I would be lying if I said I fully and authentically related to it - I've not yet reached Andy's stage. Sure, I've gone off to University and experienced the situation of packing up your room while your mum's voice gets more strained and she goes off to sniffle in the toilet - but hell, the toys were the first thing in the box! I had a lot more toys and they are facing the situation that Buzz and Co nearly did, gathering dust up in the loft. But not Hoob. Hoob is a latecomer - my brother bought me Hoob for my Christmas present this year, aged 19. For me, Toy Story 3 needs a sequel. Andy, despite having had a great time at University, begins to feel slightly alienated from the world and feels as though something is lacking. He would then come to realise that he isn't ready to live in absense of his toys - he dreams about Woody. He returns home, finds the little girls house and would rip Buzz and Woody from her bleeding fingertips if she refused to yield. Having done the deed, the film would follow him back to Uni where he lives the semblance of a normal life, except the toys are there - on the shelf as he writes the dissertation. And yes, so maybe his cleaner will come in and find Mr Potato Head and the Slinky lying limp and overloved under the duvet every now and again, fresh from a lonely spooning on a cold night on Campus. Wow, this is getting heavy. So basically, my relationship with my Hoob - which is a plush toy - is getting to depths that I never even reached when I was a child. No word of a lie, I had a nightmare last week and my first waking thought in that panic-stricken and sweating state was to reach out and find the Hoob. "Hoob?!" I would call, as I grabbed him close and hugged the demons away. It gets worse. When I'm left home alone, even if he is up in my room, I still talk to him. The Hoob is in my mind. I offer him breakfast sometimes. I made a 7 minute video about him that I am too ashamed to put on Youtube. This is a revelation - I'm being facetious about it but I am acutely aware it is probably symptomatic of some fucked up regressive state I am easing myself into. Should a 20 year old man be crying at a film, partly because it reminds him off a plush figure he has a deeply unhealthy sentimental investment in, definitely not. And I complain, but I won't do anything about it - what would Hoob do without me? I'm trying to go cold turkey on him; he is sat on the stairs now, and I'm trying that parenting technique where you just ignore their cries. I see the way he looks at me as I walk by and don't ask him what he's been up to. I'm going into therapy when I get back to Cambridge, I'd be curious to hear what the therapist thinks of this.